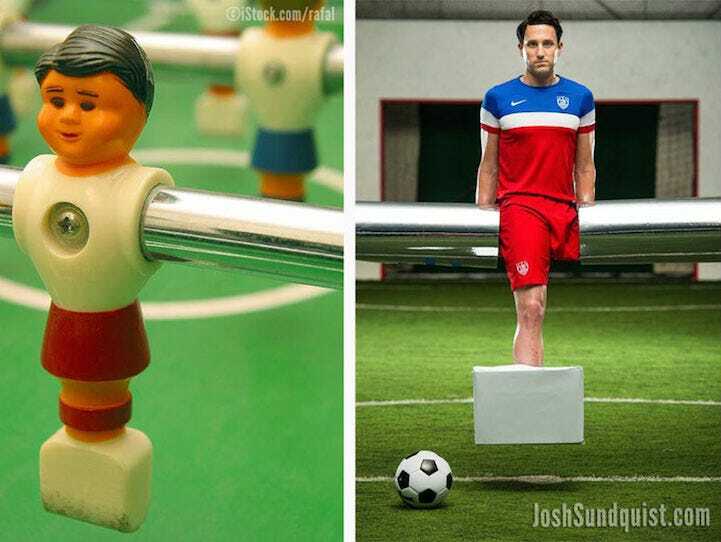 Josh Sundquist is a bestselling author, motivational speaker, cancer survivor, Paralympic ski racer, and the undeniable champion of all Halloween costumes. 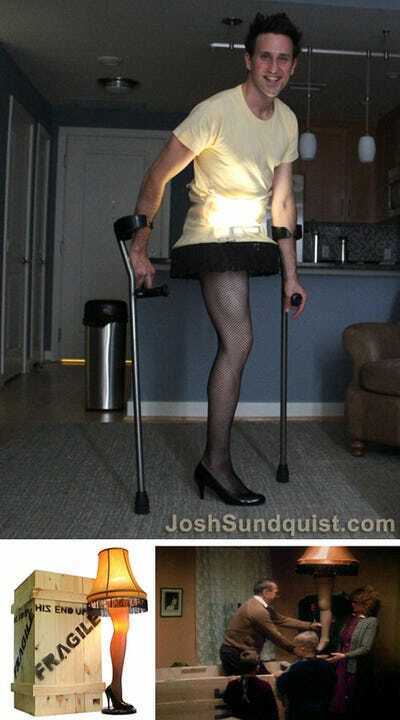 Sundquist, who had his leg amputated as a child due to a rare form of bone cancer, has spent the past few years dressing in “amputee-themed” costumes that bring a humorous light to his disability. He has dressed up as the Gingerbread Man with a missing leg from Shrek, the classic leg lamp from the movie A Christmas Story, and last year he did a crutch handstand and became a flamingo. This year to celebrate the fact that he has joined the U.S. Amputee World Cup Team, he has dressed up as a foosball player. 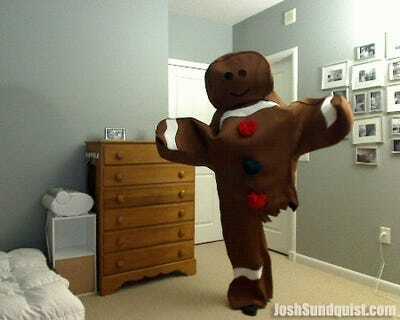 It took a lot of clever crafting to make the ingenious costume. The foosball player boot was made out of cardboard and duck tape; and Sundquist’s crutches were covered in bubble tape and a laminate covering and used as the bar. So he can use his crutches to walk around, but when he wants to transform into the football player, he simply has to put his hands behind his back. Sundquist is even able to do the signature foosball player spinning kick. Sundquist uses these Halloween costumes to celebrate what makes him unique. “I’ve always dealt with the social discomfort of my disability by having a sense of humour, but I used to be much more self-conscious,” Sundquist said on his blog. Sundquist was diagnosed with Ewing’s sarcoma and given a fifty per cent chance to live when he was only nine. After a year spent in chemotherapy, his left leg had to be amputated. He was officially declared cured of the disease by the time he was 13, and went on to accomplish many things, including becoming an extraordinary athlete. Sundquist trained for six years and in 2006, he was chosen to represent the U.S. in the Paralympic Ski Team in Turnio, Italy. Sundquist now travels across the country to give motivation speeches to Fortune 500 companies and inner city public schools. He has a bestselling memoir called, Just Don’t Fall, and has a devoted YouTube following. He also has a really incredible sense of humour. For more information about Josh Sundquist check out his page here, and keep scrolling to see some of his past Halloween costumes.